Coastal ecosystems are typically nitrogen-limited, and phytoplankton growth stimulated by excess nitrogen can generate multiple, negative ecosystem effects including growth of toxic algae, shading of benthic flora, and hypoxic conditions created by phytoplankton decomposition. Oysters have multiple effects on ecosystem structure and function. Individual oysters and their associated biofilms are important for nutrient processing, delivering nutrients from the water column to the benthos via the release of wastes. Subsequent microbial processing of these waste products can remove reactive nitrogen, suggesting that oyster restoration could help to mitigate high nitrogen levels in eutrophic systems. 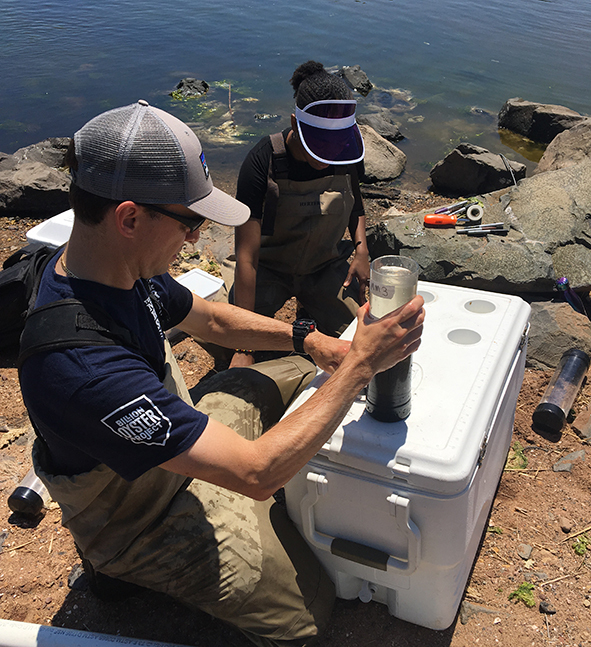 Our labs seek to understand the physiological mechanisms, environmental drivers, and microbial communities responsible for oyster denitrification. BUEE student(s) will build off these efforts by examining the role of oyster reef restoration on ecosystem functioning in New York City. Students will design and carry out field and laboratory experiments, in collaboration with partner organizations, to clarify the mechanisms of oyster denitrification, and evaluate the impact of predator-prey interactions on the rate of nitrogen processing by oysters.